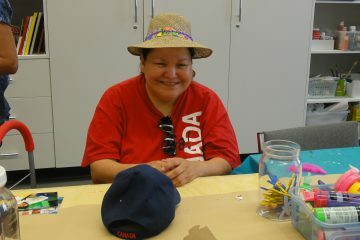 Tracey Morrison was a regular participant at the Wednesday Arts & Crafts table since the program was re-started in late 2008. It was always a delight to see her wonderful artistic talent and enjoy her easygoing and positive attitude. 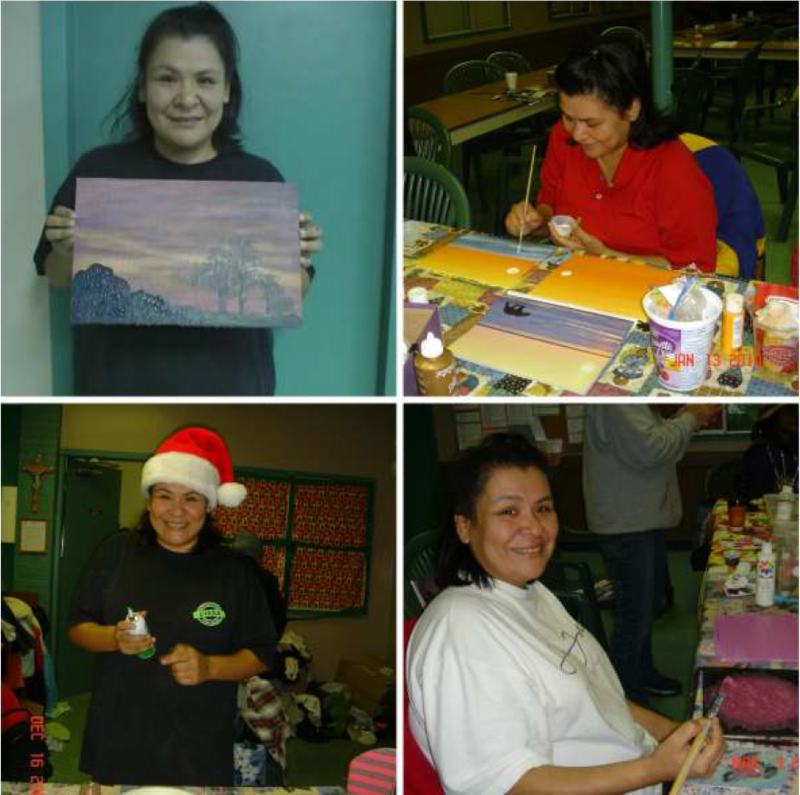 Tracey told us that the acceptance and affirmation she felt within our Arts & Crafts group was one of the experiences that built her confidence to allow her to move from “mouse” to “mouth” in her community, and we proudly watched her evolve into an activist and community leader in the Downtown Eastside. We were always proud and happy when she would drop in from time to time to greet us and update us on her activities. The Wednesday before she passed away was one such occasion – she dropped in to say her hellos and was her usual cheerful upbeat self. We were heartbroken a few days later to hear of her sudden passing. We had always been very proud of her accomplishments, awards, and work in the community, but only after her death did we get a better idea of the extent of her work, influence, and impact. Her work and awards are too numerous to list but a few of the things she was proud of include the following: She was President of the Western Aboriginal Harm Reduction Society (WAHRS) and a member of Vancouver Area Network of Drug Users (VANDU). She was the recipient of the St. Paul’s Hospital Community Leadership Award for her “Nothing about us with us” work. 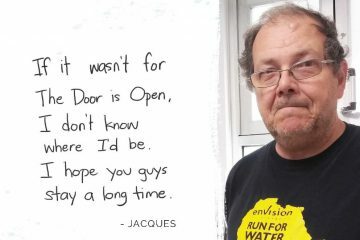 One of the many projects close to Tracey’s heart was the creation of an Aboriginal Health, Healing and Wellness Centre in the DTES. It would be a wonderful tribute to her memory to see this Centre become a reality. The City of Vancouver published a report1 on this, and the report opens with a letter from Tracey. This letter was also published in February 2017 for CBC’s “Point of View” in an article titled “Why we all have to be part of fixing the fentanyl crisis”2. Tracey participated as part of a panel on CBC Radio talking about the fentanyl crisis (or “crysis” as she named it). Tracey was a committee member of the BC Centre on Substance Use (BCCSU). In the Spring/Summer 2017 edition of the St. Paul’s Foundation Promise magazine, Tracey was named as one of the “Superheroes of the Community” by the BCCSU3. She was a co-author on the study “‘They treated me like crap and I know because I was Native’: The healthcare experiences of Aboriginal peoples living in Vancouver’s inner city” published in the Social Science and Medicine Journal in April 20174. She lived a full and fulfilled life, much loved and respected in her community and the city. 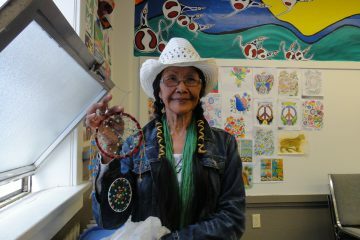 She touched many lives through her activism and her work, and will be remembered for that and much more (like her bannock5) at The Door is Open.